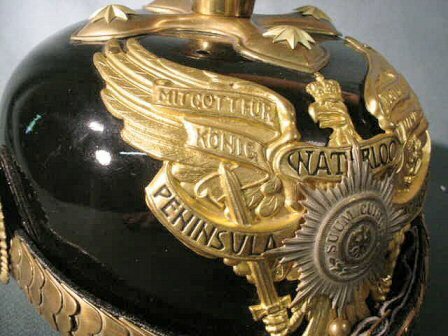 DESCRIPTION:Here in all its beautiful glory is the finest Pickelhaube you will ever see! We kid you not! 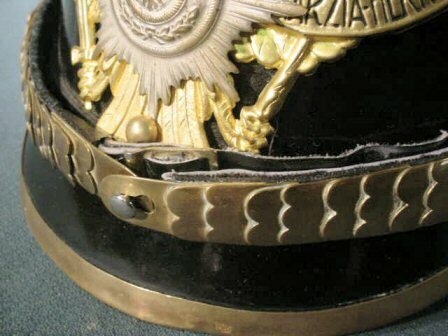 Why is this helmet in such absolutely incredible condition? Because it was manufactured in about 1935. 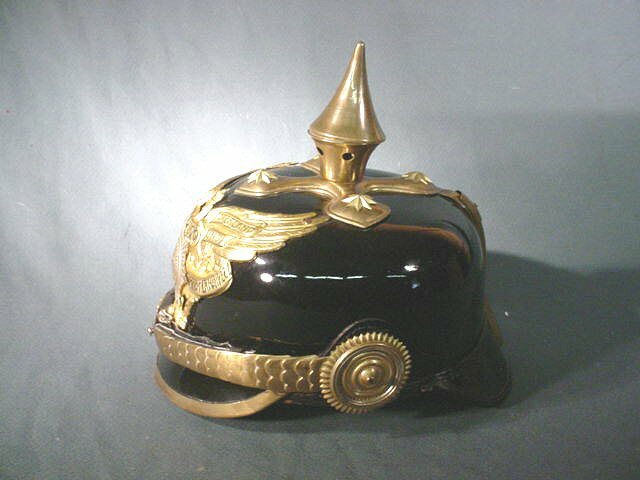 This is a special helmet constructed in the Third Reich for high-ranking officers who through acts of war or age no longer had their original equipment. Adolf Hitler liked to be photographed with former officers of the Kaiser's army. It gave the impression of solidarity with the heroes of the Great War with the "New Order." 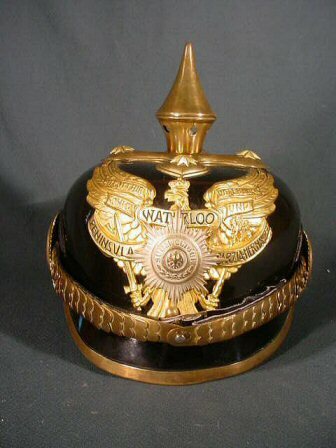 This helmet is immaculate with various changes from the manufacturing designs of the originals of the Kaiserzeit. 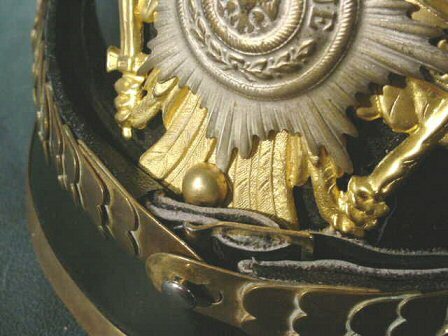 The eagle shield has special battle honors. 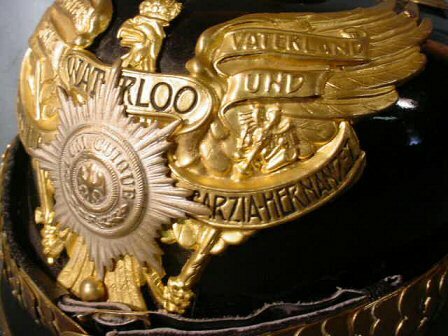 The words "Waterloo," "Peninsula," and "Garzia Hernandaz" are inscribed. The latter was worn by the First and Second Heavy Dragoon Regiments KGL at Garzia Hernandaz 23 July 1812. These two heavy dragoon regiments broke three formed squares of French infantry in what was the greatest cavalry action against infantry in the entire Peninsula War. 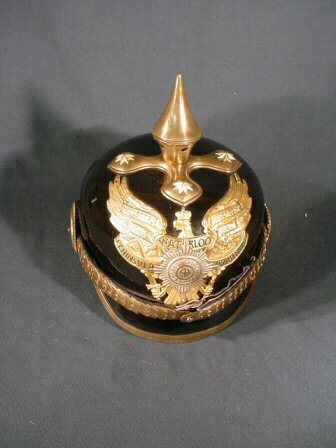 This is an officer's helmet of the Prussian Garde Dragoons. 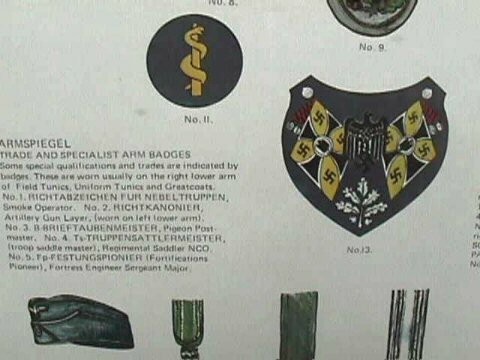 These elite regiments were held in great honor during the Third Reich period and at special N.S. veterans' rallies. 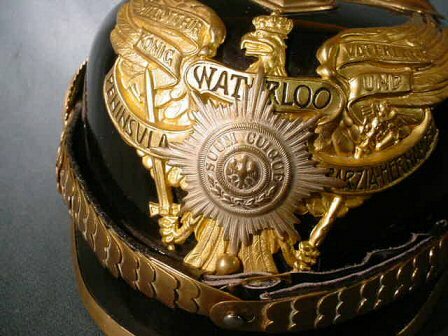 The former officers often dressed in the full splendor of former days for the ceremonial pomp and pageantry, but also they were vastly encouraged to do so for the value of tradition and to favorably impress the young people who attended such events. This is a tremendously rare and eminently important relic of the Reich that either an Imperial collector or a Third Reich historian would be extremely proud to add to their holdings. 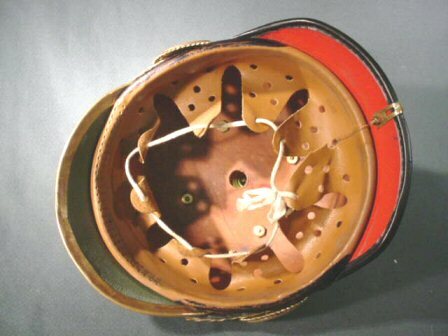 Make no mistake, this piece of German headgear is of the very highest quality imaginable. Genuine (thick) leather so elegant and fine as to see your reflection in its jet-black mirror finish. 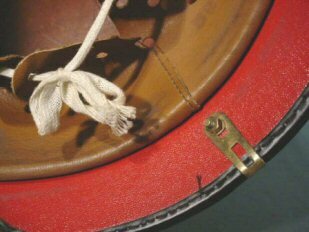 The Kokarden have no national or state colors. 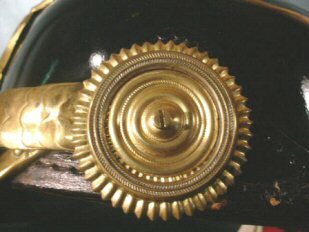 They are in plain gilted brass. I believe that there may have been a political meaning to this. The N.S. regime tried to move away from the state loyalty theme to a certain extent. 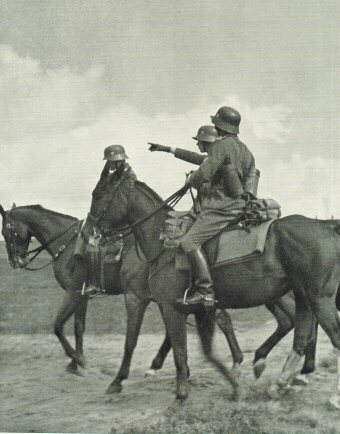 Thus, Ein Volk, (Ein Reich), Ein Führer! The key words here are one nation! 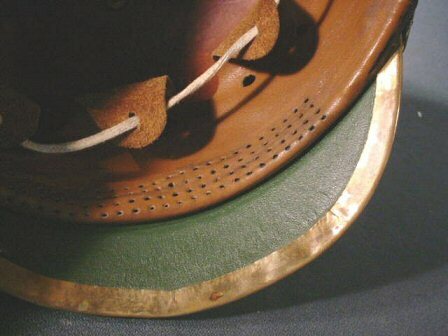 We have never in any collection in any museum (anywhere) seen a spiked helmet finer than this pristine example that we offer here. Every part of it is fine and mint to include the inside parts, liner, etc. We just can't say enough about it. 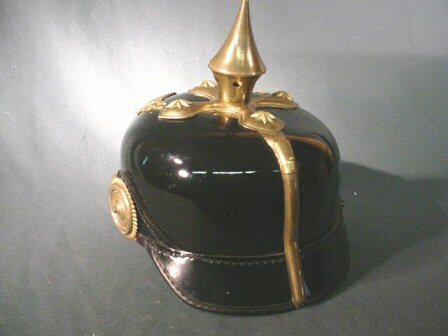 We at Germania International, LLC are extremely proud to offer it to the collecting public. There may be better ones as far as price and grandeur, but there can't be another in better condition or more scarce. Absolutely stupendous! 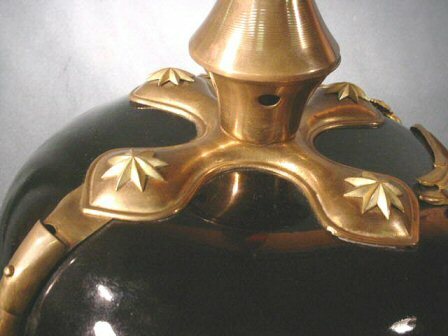 PRICE: $2,650.00; Sale, reduced to $1,800.00; A REAL bargain !!! DESCRIPTION:This was one of the most desirable of the Wehrmacht swords out of over 100 variations belonging to the German Army. Thomas Johnson, the author of Collecting the Edged Weapons of the Third Reich on page 151 of the first volume calls this pattern RARE! 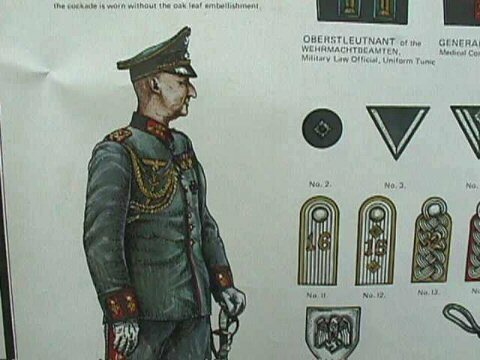 Major John R. Angolia in his book Swords of Hitler's Third Reich refers to it as (handsome) and says to accommodate the unusually large eagle on the cross guard it bears the uncommon feature of having the hilt ferrule, cross guard, and knuckle-bow all cast in one piece. 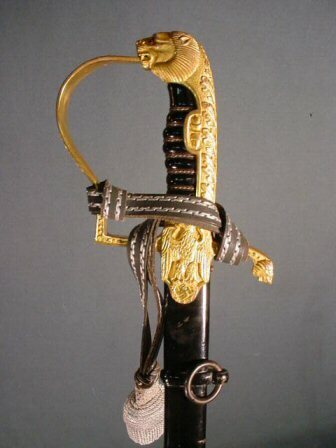 Certainly, this is one of the most beautiful of all the army swords and has been the most sought after of all. This is as near to that elusive word 'mint' as we have ever seen. 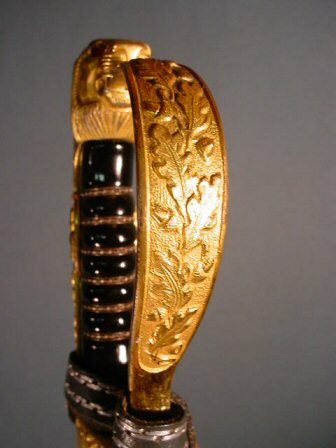 We at Germania have continually been offered German Army swords by the hundreds, but in keeping with the promise to constantly offer only the finest and most rare of the Reich relics we try to present on our pages such items that excel in quality and sheer beauty. This Holler 21 sword certainly meets this criteria. When we bought it at a military show recently all the usual 'vultures and buzzards' were hot on our heels to buy it, but, of course, at a depressed price. We passed at this opportunity to sell it to these undeserving opportunists, who could not have cared less about the culture and history connected to a wonderful item like this. Excuse our descriptive terms for these leeches, but that is our mood for today. 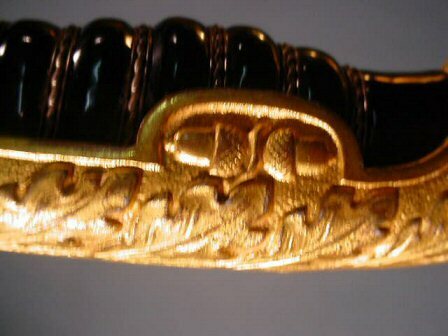 The bright part, however, is that we are looking at this great and gorgeous sword and that is uplifting, indeed. 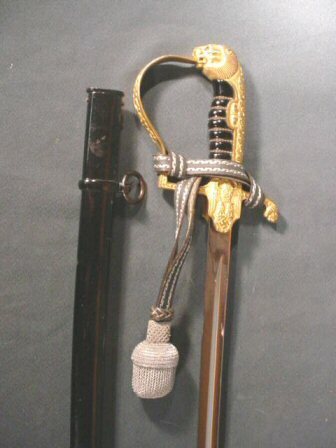 It is 36 inches long in the scabbard. 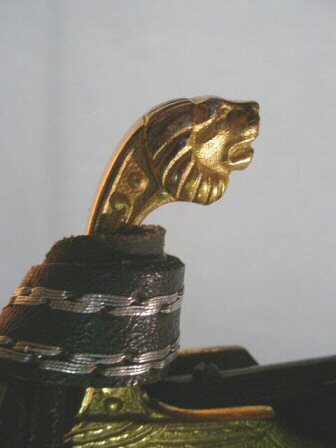 The gilting is all brilliantly intact; the blade, stone mint; the lion's eyes, a piercing ruby red. It has the original knot. 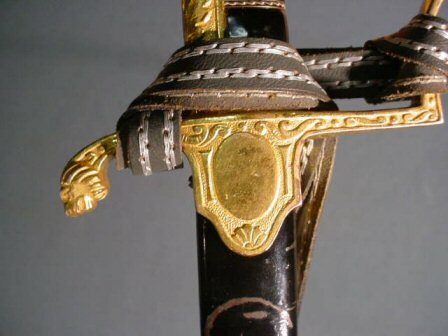 The scabbard is excellent plus-with the small scratches in the paint that comes with natural age and wear. The sword is by F.W. Holler of Solingen and has its logo. Here is the exception in condition and rarity. 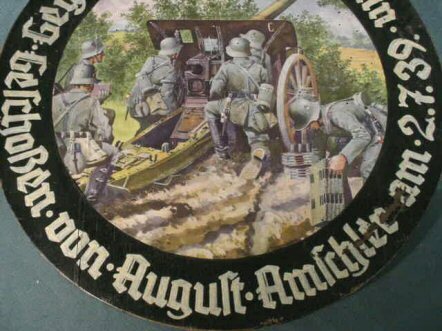 DESCRIPTION:Here is a really great and fascinating German Army target. 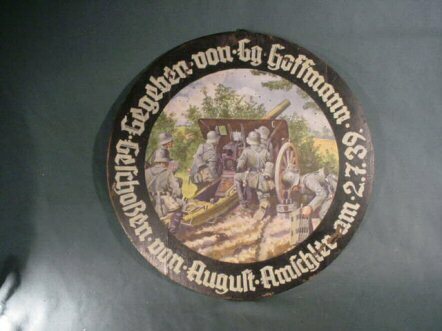 The German’s had the odd and peculiar custom of making up a roundel of wood decorated in the best of taste and artistic accomplishment and then using it as a target. The target then becomes the prize for the best shot in a contest of rifle or pistol shooting. 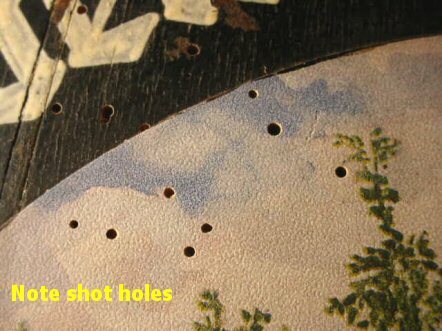 Often, .22-caliber rifles were used in these contests, but in this case and because of the very small holes evident, a parlor gun or Zimmershutzen was employed. 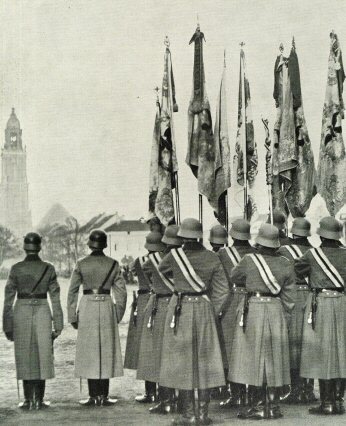 A Herr Soldat Hoffmann was the Shutzenkönig, or top contender, in a contest on July 2, 1939 (the eve of the Second World War). The center is a fine color print, but the presentation wording is hand lettered. The scene depicts a German artillery company in action. 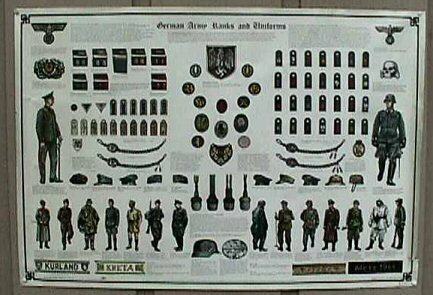 Highly dramatic, highly Teutonic and just a great item to hang in a WW II collection. 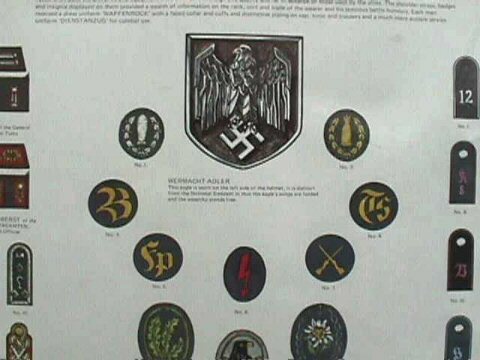 DESCRIPTION: This is an exception in that on Germania we only handle the actual genuine items of the Reichs. The reason we interject this is at customer request and it is almost an antique in any case. These charts are over 25 or 30 years old. Having been produced in England from an original WWII British Intelligence source. Naturally being British produced there is no attempt at being objective in the portrayal of its enemies' faces. 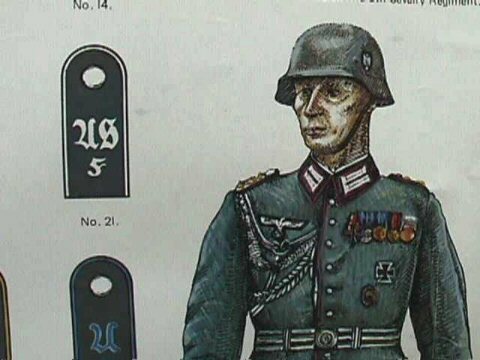 They are shown as sinister, grotesque, evil countenances, but it can be said that at least the insignia and uniforms are correct. Again, I remind you that these are not produced today. They are very limited in quantity and we have only a few. They have been tossed around in warehouses for many years and a few are nicked here and there, but most are quite presentable and framed. They are quite striking, indeed. They are 33 ½ x 23 ½ inches in size on glossy paper. They won't last so I suggest you get one now!